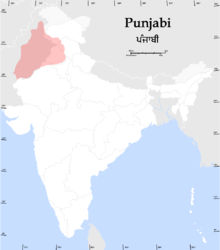 Punjabi is an Indo-Aryan language. It is the native language of about 130 million people, and is the 10th most spoken language in the world. Most of the people who speak this language live in the Punjab region of Pakistan and India. It is also widely spoken in Haryana, Himachal Pradesh and Delhi. It is natively spoken by the majority of the population of Pakistan. Punjabi developed from the ancient language of Sanskrit just like many other modern Indo-Aryan languages. Punjabi is unusual among this group for being a tonal language. 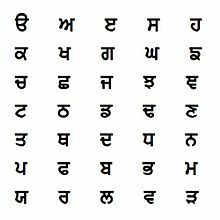 Punjabi is written in two different scripts, called Gurmukhī and Shahmukhī. Punjabi is the main language spoken by the Sikhs. Most parts of the Guru Granth Sahib use the Punjabi language written in Gurmukhī, though Punjabi is not the only language used in Sikh scriptures. The Janamsakhis, stories on the life and legend of Guru Nanak (1469–1539), are early examples of Punjabi literature. Punjabi has many dialects. The dialects are similar enough to each other that speakers can understand most of the dialects that are related to theirs. In India, the main dialects of Punjabi are: Majhi, Doabi, Malwi and Pwadhi. In Pakistan, the main dialects are Majhi, "Shahpuri", "Jhangvi", "Dhanni", Pothohari and Hindko. Majhi is Punjabi's standard dialect because it forms the standard for writing in Punjabi. It is spoken in the centre of Punjab, including the districts of Lahore, Sheikhupura, Kasur, Okara, Nankana Sahib, Faisalabad, Gujranwala, Sialkot, Narowal, Gujrat, Pakpattan, Hafizabad and Mandi Bahauddin. In India it is spoken in Amritsar, Tarn Taran Sahib and Gurdaspur districts. Other dialects of Punjabi include Pahari, Rachnavi, Chenavari, Chhachi, Jandali, Ghebi. The Saraiki, spoken in southern Punjab, and Dogri, spoken in Kashmir, are closely related to Punjabi. The relation of several dialects to languages other than Punjabi creates problems in assigning them to one or another "language". Over 93% of people who speak Punjabi as their first language live in Pakistan and India. It is the most widely spoken native language in Pakistan. It is spoken as a first language by over 44% of Pakistanis. There were 76 million Punjabi speakers in Pakistan in 2008. In India, Punjabi is spoken as a native language by 3% of the population. This was about 33 million in 2011. It is the official language of the Indian states of Punjab and Haryana. Punjabi is also spoken as a minority language in several other countries where large numbers of Punjabis have emigrated.In the United Kingdom, it is the second-most-commonly used language. In Canada, it is the fourth-most-spoken language. There were 1.3 million Punjabi speakers in the UK in 2000, and 368,000 in Canada in 2006. There are three ways to write Punjabi: Gurmukhī, Shahmukhī, and Devanāgarī. In the Punjab province of Pakistan, the script that is most used is Shahmukhī. The Majhi dialect is the written standard for Punjabi in both parts of Punjab. ↑ "Punjabi, Eastern". Ethnologue. Ethnologue. Archived from the original on 12 July 2017. Retrieved 13 August 2017. ↑ "Punjabi, Western". Ethnologue. Ethnologue. Archived from the original on 12 July 2017. Retrieved 13 August 2017. ↑ "Pakistan Census". Census.gov.pk. Archived from the original on 12 September 2011. Retrieved 4 January 2014. ↑ Hammarström, Harald; Forkel, Robert; Haspelmath, Martin, eds. (2017). "Punjabi". Glottolog 3.0. Jena, Germany: Max Planck Institute for the Science of Human History. ↑ Barbara Lust, James Gair. Lexical Anaphors and Pronouns in Selected South Asian Languages. Page 637. Walter de Gruyter, 1999. ISBN 978-3-11-014388-1. ↑ "Punjabi language and the Gurmukhi and Shahmuhi scripts and pronunciation". Omniglot.com. Retrieved 2012-08-03. ↑ Geeti Sen. Crossing Boundaries. Orient Blackswan, 1997. ISBN 978-81-250-1341-9. Page 132. Quote: "Possibly, Punjabi is the only major South Asian language that has this kind of tonal character. There does seem to have been some speculation among scholars about the possible origin of Punjabi's tone-language character but without any final and convincing answer..."
↑ Grierson, George A. 1904–1928. Grierson's Linguistic Survey of India. Calcutta. ↑ Masica, Colin (1991) The Indo-Aryan languages. Cambridge Univ. Press. p 25. ↑ Burling, Robbins. 1970. Man's many voices. New York: Holt, Rinehart and Winston. ↑ Shackle, C. 1972. Punjabi. London: English Universities Press. p 240. ↑ 17.0 17.1 McDonnell, John (7 March 2000). "Punjabi Community". Parliamentary Business: Commons Debates. UK Parliament. p. Column 142WH. Retrieved 15 July 2012. ↑ "Punjabi is 4th most spoken language in Canada". The Times of India. 14 February 2008. Bhatia, Tej (1993 and 2010) Punjabi: a cognitive-descriptive grammar. London: Routledge. Series: Descriptive grammars. Singh, Maya (1895) The Panjabi dictionary. Lahore: Munshi Gulab Singh & Sons.